_MAL4843, originally uploaded by Michael A. Lowry. I just returned from my first trip back to Stockholm since moving to Züruch two months ago. I was in town on business for a couple of days, teaching a TWS course for IBM. I extended my stay to include the weekend and Monday so that I could spend a bit more time in my old home and visit with friends. Friday night I went the Klättercentret’s fifth anniversary party. The evening began with a bouldering competition. I enjoyed it very much, especially when I surprised myself by completing not one, but 4 black-graded problems—and this after months without any regular climbing to speak of! After the competition, the climbing came to an end and the real party began. Thai food and beer were served, and later in the evening we toasted to KC’s success with Champagne. Around one o’clock in the morning, a bunch of brave men took turns leaping from the central tower to try to grab a trapeze hanging at eye level about two meters out from the platform. I managed to grab the trapeze with one sweaty hand; but did not manage to hold on. The guy after me was the first one to nail it. It’s not easy to jump straight off a platform fifteen meters up in the air, even if one does have a rope to catch one’s fall! A live band consisting of several fellow climbers provided entertainment throughout the evening, and I saw so many of my old friends there. Being back at KC was bittersweet. I really miss the place. In the evening, I caught a ride from Helena back to her place. She was kind enough to let me crash at her apartment for the weekend. On Saturday, I had dinner with Shahyar and Farzhaneh, the couple who are leasing my apartment in Bergshamra. Farzhaneh is an excellent cook, and prepared seveal tasty Persian specialities. In return, I helped get their internet connection up and running. Later in the evening I met Lotta on Gamla Stan. We went to the Lucia concert at Storkyrkan. It wasn’t as good this year as in years past, but I still enjoyed the concert very much. 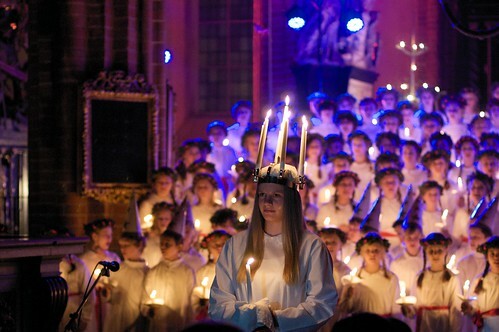 This time of year, and Lucia in particular, will always remind me of my first visit to Stockholm in December of 1999. After the concert, Lotta and I had cake and coffee in the cellar of Chokladkoppen, a hip and cozy little café on Järntorget located in a building that must be at least five hundred years old. Saturday night after the concert, I joined Helena and went to O’Leary’s in Sundbyberg, where Salsaakademien was throwing a Christmas party. I had an absolute blast at the party, dancing with so many of my friends from the Stockholm salsa scene. It felt just like old times, and everyone seemed glad to see me. Some of the best dances of the evening were with the ever-lovely Alexandra. The Sacuye gang delivered some great dance performances too, including one by Ibi and Marina that left me with a bewildered grin on my face for the next ten minutes. Those two have talent! Sunday morning I met a couple of friends for brunch at Café String, and in the afternoon I went to Karbin for a bit more climbing. There, saw Emma and Bobo, and I made two new friends, Michaela and Alex. Monday morning before my flight back to Zürich, I met Åsa downtown at the main train station. After a quick coffee, we took a walk in the brillinant morning sunshine. It was cold and windy, but we endured the cold with ease, soaking in the light and warmth of the sun. We walked down to Stadshuset and to the edge of Lake Mälaren. I’ve lived several months now in Zürich, and I am finally beginning to feel like it is a place I might someday call home. However, Stockholm is stil home, and this trip was reassuring, if a bit bittersweet. It’s nice to know that the city and friends that I know and love are just a few hours away, and ready to welcome me again any time I choose to visit.